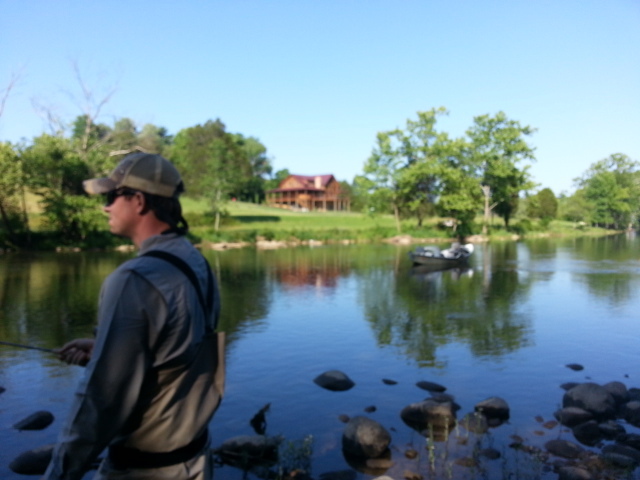 Great Day of Rainbows and Smallies…. Fri. June 27, 2014. …What started out as a great morning stayed that way, I guided Curtis Reeves and after a great morning the rest of the day proved to be good to until mid afternoon when the 94F temps put a damper on the fishing. We also had thunderstorms all around us. But not before landing 15 to 20 rainbows from 17 to 23.5", along with 10 smallmouth bass from 1 to 3 pounds. 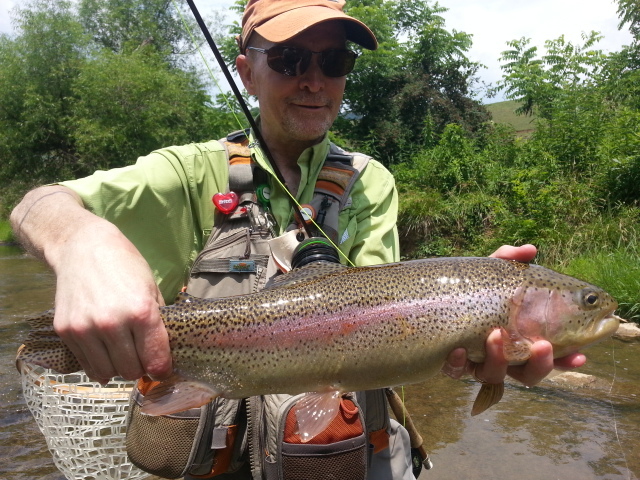 The rainbows we caught sight fishing with dries, including the largest one….a near two foot long rainbow that ate a size 6, yes you read that correctly, a size 6 dry fly. 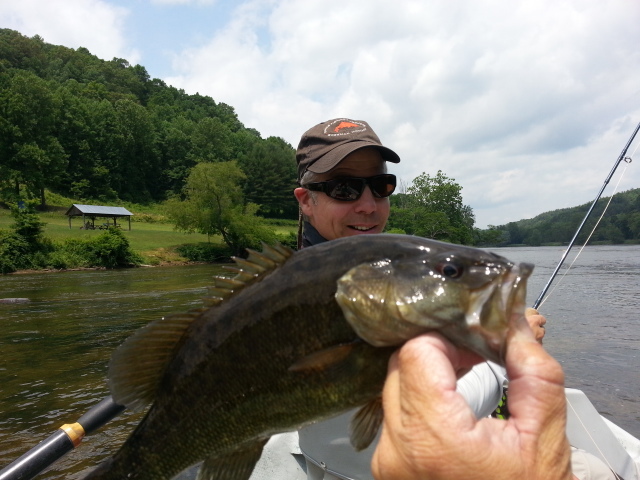 We also caught the smallies on top, they either took one of my black ant dries or a popper. Great day, great to spend it with Curtis. We knocked off at about 530pm and headed home. I have a half day trip and lesson with Clayton Patteson tomorrow and I will be teaching casting, line management, and we will also spend some time putting those skills to work trying to catch some bass and bluegill. Should be another great day. Fri. June 27, 2014……Great morning guiding Curtis Reeves of Archdale, NC and we got an early start and have done well, landing several nice small mouth up to 2 lbs and a dozen rainbows up to 23.5". 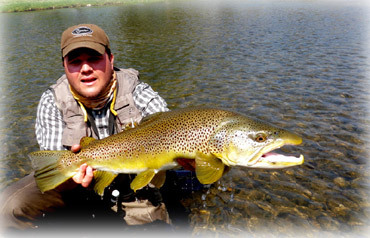 We have sight fished to everyone and seeing a giant fish eat a dry fly is something special. We have caught all fish on top…..so summer has some redeeming qualities for sure. Headed to the next spot……..this is going to be good…. Too Much Heat for Good Fishing….Right? Nada. Sun. June 22, 2014….Too hot to do well on the water right? Nothing could be further from the truth. 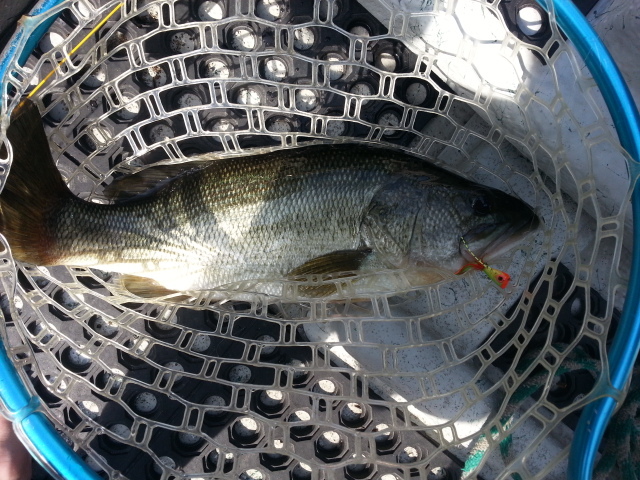 Had some great bass and panfish trips lately, and also doing really well on smallmouth. Had lots of good trips lately, and doing well on the tailwaters as well. 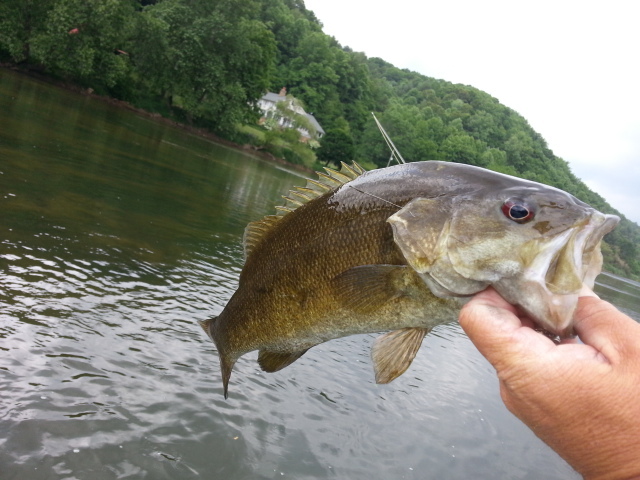 Just had a moment to catch my breath, put together these clips for the start of our summer smallmouth fishing…..
Our summer fishing is just getting kicked off. 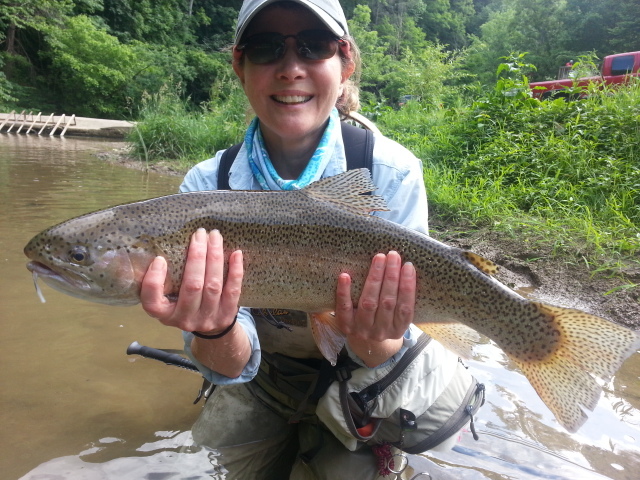 Lots of opportunity, public water, private water, more smallmouth opportunities than you can shake a stick at, tons of sight fishing for trout, particularly if you like the stalk and hunt game, plus tons of great dry fly fishing on the tailwaters. More than you could do! In any case, hope your weekend was great, will be on the water tomorrow guiding Patti Nolan and her son on one of our private trophy waters, and Tuesday will be guiding another smallmouth float trip on the New River guiding Mike Workman and Brian Fitzgerald from Thomasville, NC. Looking forward to a great week…. Sat. 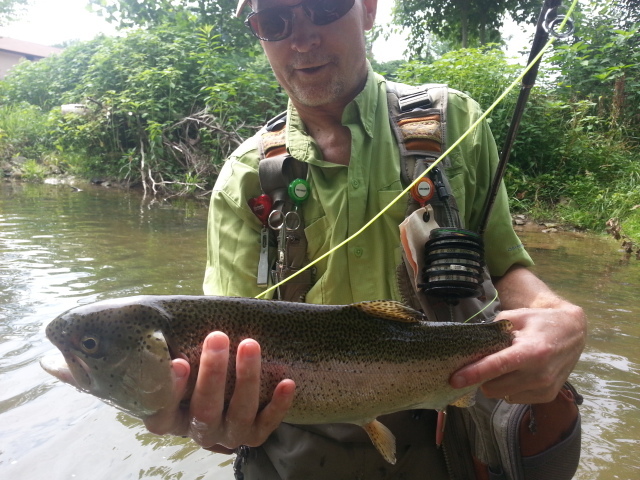 June 21, 2014…..Great day today on the South Holston, we started our day in downpours and a half muddy river. Guided Dr Bose Ravenel and Durham Potter, Raleigh, NC, and we were into fish almost right away. First we worked them over with midges, then a dry/ dropper rig using a Sulphur or a big stimulator with a new fly I have been using called a TN Turd. It works well, in fact for the next several hours we nailed fish after fish. Bose headed out at 2pm, Durham and I went to another spot and got into some sulphurs. 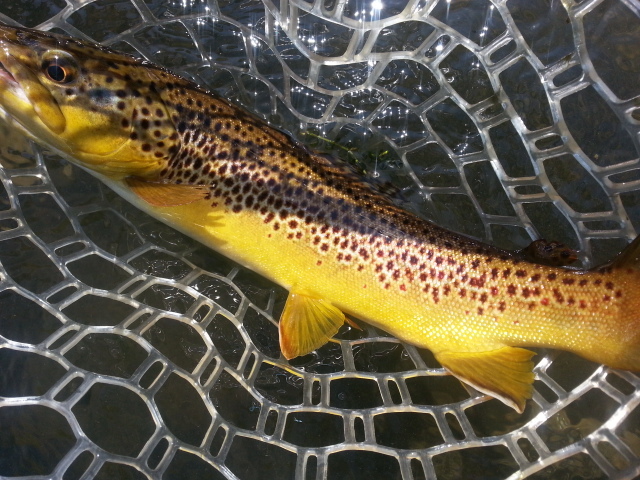 Caught a lot of fish on dries, mostly sulphurs but we did nail several fish on terrestrials as well. It was good…..
Got back in late, looking forward to a day off tomorrow. ..enjoying the Lord’s day and relaxing a bit before another busy 5 trip week again next week. Sat. June 21, 2014…..First day of summer …..Guess it’s official. Of course it’s felt official for sometime. We have had a hot start to the summer, and recently add some regular storms to the menu. Hot, humid…..summer. It’s here…. Had a great day yesterday, guided Dr Bose Ravenel and Durham Potter on a New River float trip and we fished for smallmouth. Did well putting 35 or more in the boat, and several quality fish. Some of them were on surface bugs, my/our favorite way to catch them. We floated a six mile section near Woodlawn/Galax, Va. River is quite clear even with all the daily thunderstorm activity. Fish are really turning on to poppers, as evidenced by the large numbers of quality fish you could see cruising . Fun to watch a big smallmouth stalk your popper…..pretty sweet. Will post more later……have a great weekend. ..
Thurs. June 19, 2014…..Busy week, been dodging fly lines and lighting bolts….lol, we are in the typical summer Bermuda High pressure that puts the hot, humid air on top of us and plenty of instability for afternoon storms. And we’ve had a lot of them. But hey, its summer, and that’s normal. Not global warming, not some bizarre turn on planet earth. Normal. Had a busy week, and a lot of stuff to work on around here with regard to upcoming trips….including Wyoming trips 2014 and 2015…..my week really started on this past Saturday. Guided Ken Teague, Winston-Salem, NC, and met Ken early in Bluff City, TN and we hopped in the driftboat and headed upriver. 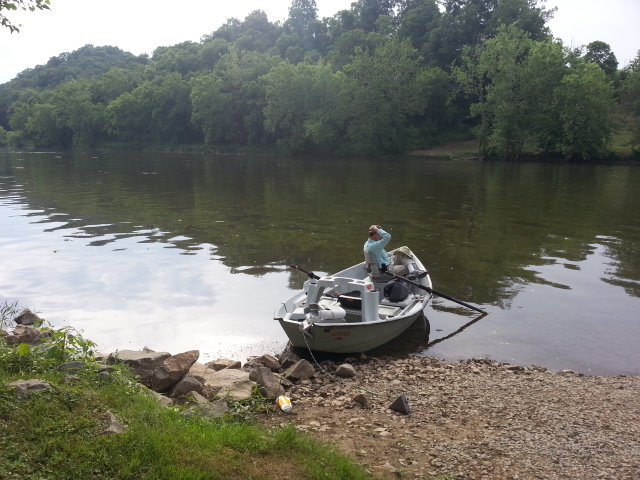 Lower river is full of gizzard shad, I am sure the stripers and big browns are having a feast. We didn’t see any stripers but I am sure they will show in the coming weeks and months as the TVA gets on its summer release pattern. Ken and I fished the lower river, caught a few fish, jumped a nice brown that appeared to be in the 20″ category, it took a double nymph rig and jumped right after the hookset and was free….bummer! We fished on and caught maybe a half dozen fish on dry /dropper rigs. We then trailered the boat and headed up river to see if we could find a hatch. Indeed, bugs were coming off, not a ton, but just enough to get the fish up and rising. We did much better in the afternoon, landing probably 30 fish or so, some on beetle patterns and others on sulfur dries and a dry dropper rig with a weightless nymph. We sight fished to fish for probably 4 to 5 hours and had a lot of fun doing that. Was surprised we didn’t do better early in the day but later made up for it. Ken was a blast, a good fly fisherman, great to spend a day with. Had a Monday trip at Dunlap Creek, the Escatawba Farms section, and guided Ron Feltz, Waco, TX …….met Ron and his clients Greg, Kirk, and Ben early at the Farm and we were off and in the water fishing….had some success early, big dries, a mish mash of rubberleg patterns, large and small, as they always do in June, did the trick. 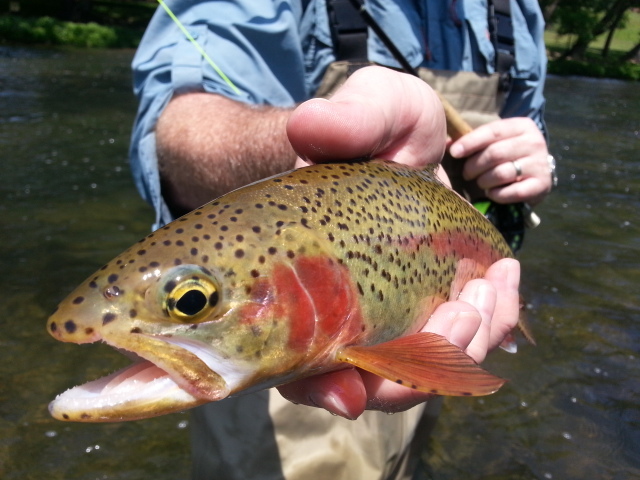 We caught some huge rainbows, and by lunch time we’d landed maybe 25 to 30 fish altogether up to 24 inches. We had a quick lunch, then back in the water for some sight fishing. 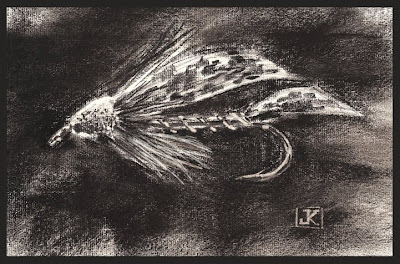 We murdered fish on inchworms sight fishing to cruisers…..find a cruising fish, put the inchworm 3 to 4 feet ahead of them, watch them bolt or cruise over and eat it. Its sight fishing at its best….we landed a 25 to 30 more fish mix of browns, rainbows, and brookies doing this, while Ron worked his magic using dry/dropper combos. It was a great day, and we didn’t even fish to the close to 100 cruising bass and bluegill in the lake……..Great day, great guys, here are some pics of our day. Would have had a gazillion great photos, had not yet another smartphone (mine) taken a mid morning swim in the river….ooops……. Also the past two weeks have been doing a lot of fishing and guiding for bass and panfish trips on days I am not in the mountains. Its been good despite the heat. On Wednesday I guided Sandeep Mazumder, Winston-Salem, NC, and we did a Local bass/panfish boat trip, we met early in Oak Ridge and were off, it was pretty good early, steady actually, and as the sun got high in the sky we hit the shade hard. 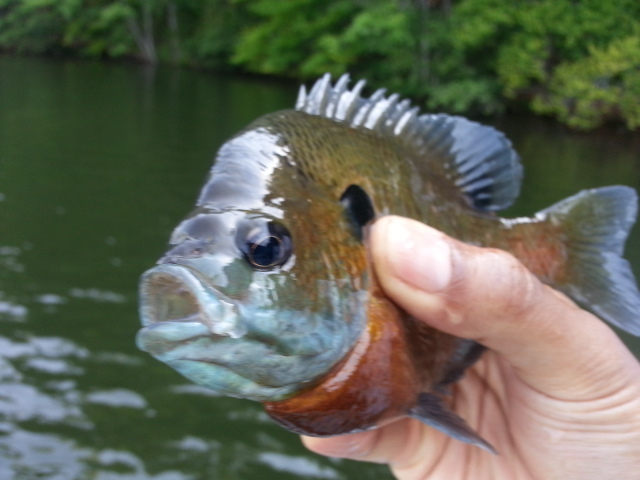 We fished mainly for panfish, and sight fished to a couple of 8 to 9 lb bass, one of which tried to eat a bluegill of about 8 or 9 inches long……ended up with about 30 to 40 nice hand sized or larger blue gills and a good many smaller ones. While surface fishing has been really good, we took a different route today…an intentional move by me……just to try our hand at some deeper water fishing with the recent heat wave. We fished a lot of deep points and fished structure very methodically. It paid off….We did very well with the deep rig, and the killer hot fly for today was one of my flies from way back fishing at Callaway Gardens in Georgia…..the RLD, or rubberleg dragon, a fly /bluegill killer originally conceived by Carl Warmouth….great pattern, and the olive or black with hot yellow legs destroyed them today. We caught fish right up even in the heat, and saw one of the largest bass I have seen in weeks try to eat the last bluegill we landed. The fish followed all the way to boat side and couldn’t have cared less that we were there. It was totally unafraid of us altogether. But it was a great day, we quit at 2pm and probably good as I have come down with some sort of stomach bug……major yuck. Hope I am in shape for end of the week trips…. Nice that we are getting rain as local small streams needed it badly, flows are improving and helping as hot as it has been. The most reliable fishing, and its normal for summer, is tailwaters. 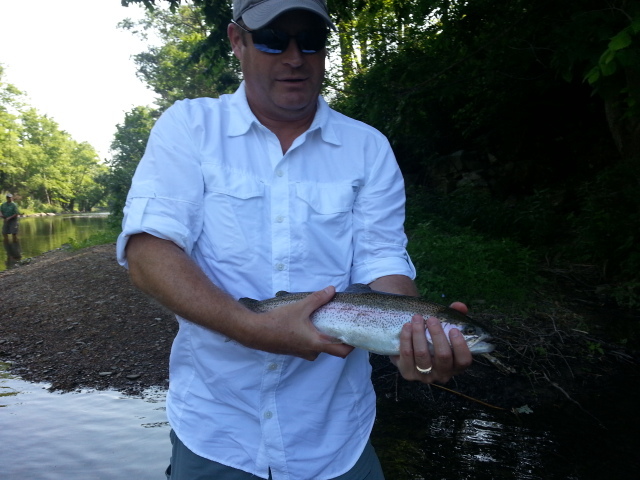 On the Smith River, sulphurs still on the upper end, BWOs everywhere else, terrestrials everywhere else…..TN Tailwaters have fished well despite the TVA not generating on the South Holston since March. 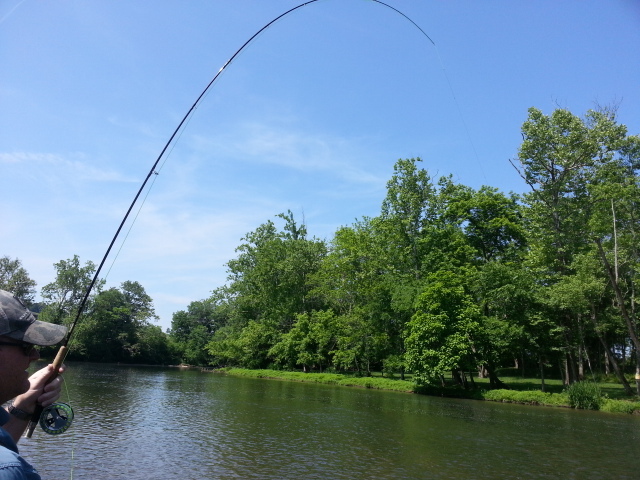 Lower river is warm, up to around 70F so we’ve been fishing more on the upper end. The Sulphur hatch is decent, still spotty, but better than it has been thus far this year. Bugs heaviest after the afternoon pulse……nymphing continues to be good with a sulphur dry and a sulphur nymph or midge dropped off the back being about the hottest thing you can throw right now. The terrestrial bite is also developing nicely, and with all the Jap beetles out now it will only get better. Be prepared with ants though for those fish that snub a beetle. Also , look before you leap. Make sure you look where you are stepping into the water…the best fish you see all day might bolt off in terror from there. Caution. Discipline. That is what it takes. Also, have been a bit under the weather…bizarre. But isn’t fun to have the summer bug. Missed a trip today with one of my good customers Ho Lee, Mathews, NC. A lot of trips coming up, and I finish the week doing a float trip guiding Dr. Bose Ravenel and Durham Potter on the New R for smallmouth and Saturday the South Holston with Durham and Boze again. Should be some great fishing, hope we can dodge the storms, looks like a soggy forecast. Will have some more reports from the water on tomorrow’s trip…..thanks and have a great evening! 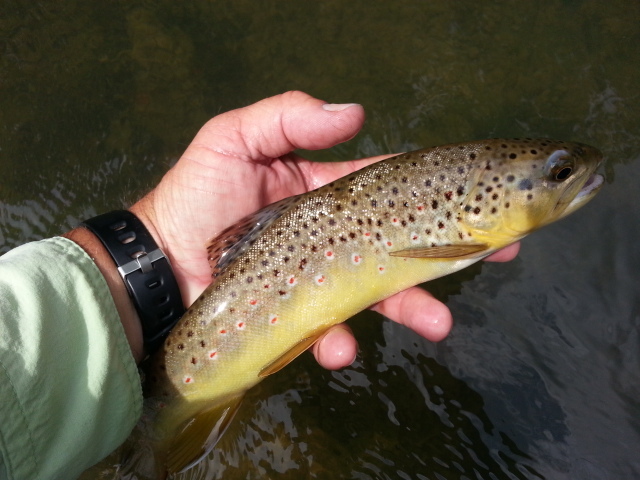 19 1/2 inches of South Holston wild brown trout…………a true treasure. Two Good Days Back to Back…. Sun. June 8, 2014……Just off from two days guiding one trip on the SoHo with Tim Pastoor and Tom Parshley and we had a good day albeit without any hatches or rising fish to speak of. The bugs were light to non existent but we caught a ton of fish nymphing and some of them really nice. It was good enough that when I asked the guys if they wanted to go upstream after we ate lunch, and see if we could find a Sulphur hatch, they said "nah, there are plenty of fish and good ones here." Probably why we did well….stayed put and we didn’t leave fish to find fish. Had a good day yesterday even with a lot of folks in the water. Floated the New R with one of my fave clients Dr Jim Kramer and we did the smallmouth and musky thing. We did well on poppers, landing a number of fish up to 2.5lbs and we got all of them on flies and we catching them when on one around us caught much of anything. We were grateful for the good day we had. A busy week coming up……Enjoy your Sunday . Wed. June 4, 2014……Another Early departure, we have settled into a summer like pattern already which means good fishing early…..As early as you can get on the water. Fishing has also transitioned to hatches early and late and sight fishing and or looking for fish to fish to during the day. Often just fishing the water is counterproductive as it disturbs the water and spooks fish. A good supply of smaller nymph patterns, dry/dropper rigs, terrestrials, and smaller yellow dries should comprise your selection right now. Yesterday was the first day we have targeted sighted fish with terrestrial dries and nailed them, and we did it several times. I will be guiding Tom and Jack Wren of Richmond, VA, and I’m looking forward to another great day. We will be fishing two waters. More to come from the river. Enjoy your hump day, weekend is coming! Great Day in SW Va…. Tues. June 3, 2014 …. Great day in SW Va guiding Mimi Williams and Bob Schwirzke on a private stretch of Big Cedar Fork. We got an early start amidst some significant rain, we actually started the day in a downpour. 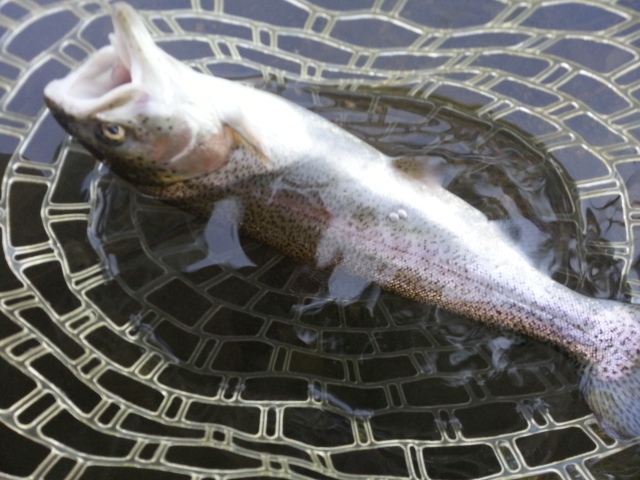 We got the first two fish, a pair of 20 plus inch rainbows……Both on streamers. No rising fish though we did catch a few on terrestrials we did the best sight fishing with nymph rigs. The rain held off for the most part and we had a 25 fish day catching trophy rainbows up to almost 28"long. It was a great day. 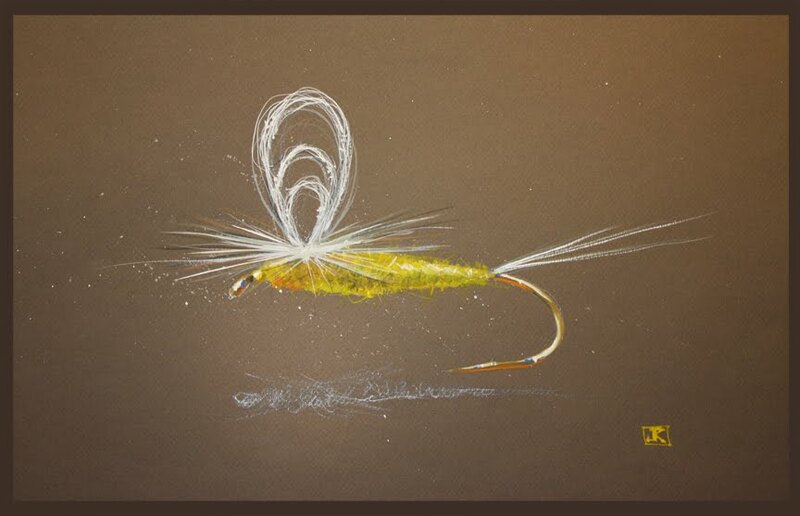 Guiding Tom and Jack Wren of Richmond, VA tomorrow on two NC waters….More to come…. Mon. June 2, 2014…..What a great day, we went the way less traveled by and that made all the difference. I did a guided Trip, Ryan Sexton, Mathews, NC, TN South Holston, got an early start, picked up Ryan in Boone and we ran over the mtn to the South Holston. I had considered two areas I knew would potentially be really good in the morning. 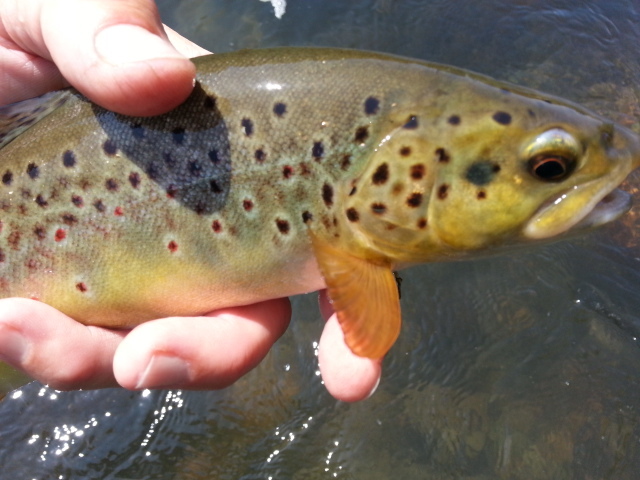 I considered it all the more since the hatches on the Holston have been somewhat light and showing no signs of building. I considered floating Ryan on the lower river in the morning or first half of the day and fishing to some large wild browns I have been working for the past several weeks…as well as having those large fish all to ourselves….and no other anglers. I decided against floating and opted to take Ryan to a great wading stretch. A stretch where the nymph fishing has been on fire. Again , it was exactly that. Not just good, excellent. I showed Ryan a special rig and a downstream reach cast , the deadliest slack line aerial mend cast there is and a cast few anglers use or understand but one that is the reason why. 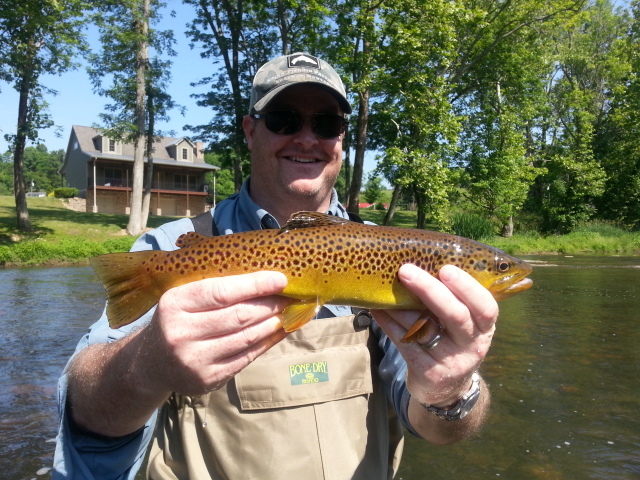 After a few pointers and a couple of practice throws, Ryan commenced to slaying some wild browns and rainbows. Absolutely killing them. We fished one long and lightly fished area, it is like that because it is hard to get to. We fished a variety of rigs, a dry /dropper to start with and a bottom fly I have been using a lot lately, we call it a TN Turd. 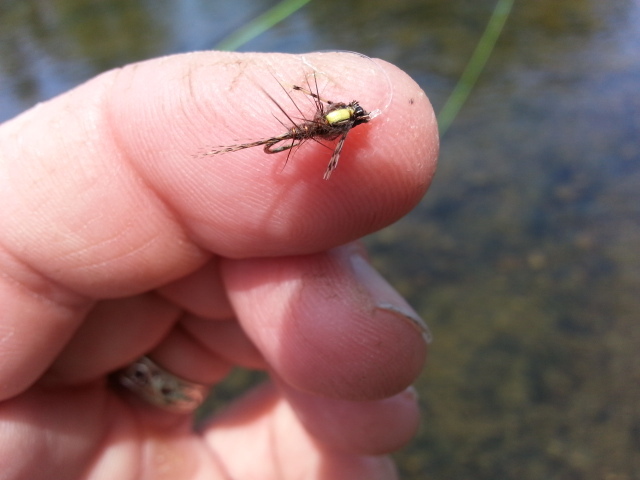 It is a simple nymph pattern that works well for a sulphur nymph imitation. We covered several deep slots with it and landed several quality fish….we must have put 35 to 40 fish in the net before lunch time. It was great, several fish on both the dry and dropper rig and also a double nymph rig using the Turd fly and a Choco Zebra dropper. We sight fished to another couple of pods of fish, then had lunch in the SUV as we headed upstream to try to catch a sulphur flurry on the falling water of the 1pm pulse. It was light, and while there were a few bugs, and a few rising fish, the fish were tough. Ryan landed maybe 8 to 10 more fish, putting the finishing touches on at least a 50 fish day. It was a well over 50 fish day…..That is stellar on the SoHo. Great day, always a pleasure to fish with Ryan…always a blast and we always seem to get into something good. Hatches continue to be all over the place with sulphurs, blue wings, craneflies, midges…all spotty at best. The mega sulphur hatch I am predicting will start coming off again when the TVA ramps up generation and cools the river down to the low 50sF. Until then, the little flurries here and there will have to do with lots of nymphing with dry /dropper rigs , bobber rigs in the deeper slots. Fortunately though, a lot of the nymphing has been sight fishing, when it is like that I’ll fish like that happily all day long. Sight fishing to large brown trout is a hoot no matter where you come across it and I am happy to do that and guide someone on to it.